System is implemented as station of strain sensors data processing and collecting. The sensors are installed in the places of supposed deformations on the vessel hull and assemblies. The system information to support ice navigation decision appears on Ice Load Monitoring panel at navigation bridge on colour display with sensor input ability for skipper. Monitoring parameters are output of original software. 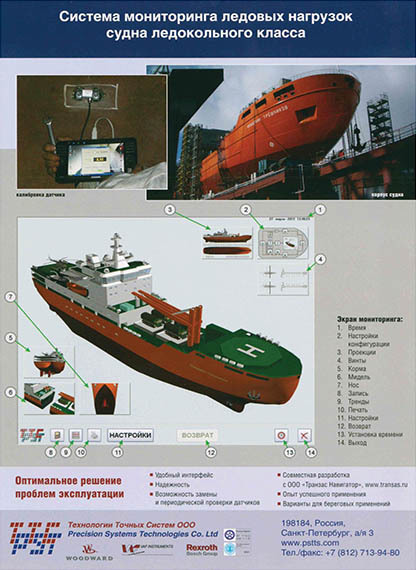 Main screen of monitoring system includes vertical projection of the vessel hull with colour arrows on it, which change colour depends on degree of critical deformations. If necessary, skipper may switch system to the mode of detailed presentation of the deformations at selected points of vessel hull, or to the modes of system history, or emergency events.